Just a stone’s throw from Golders Green tube station stands a peaceful, yet contemporary nursery, which I had the joy of being invited to last week. What struck me most upon arrival at the leafy setting – a converted church hall – was the grandeur of the building with its stained glass windows, mezzanine and high ceilings. As a teacher, I have visited many different educational settings over the years but none quite so beautiful as Safari Kid. Safari Kid are a group of global kindergartens, preschools and nurseries which pride themselves on igniting imagination and creativity. 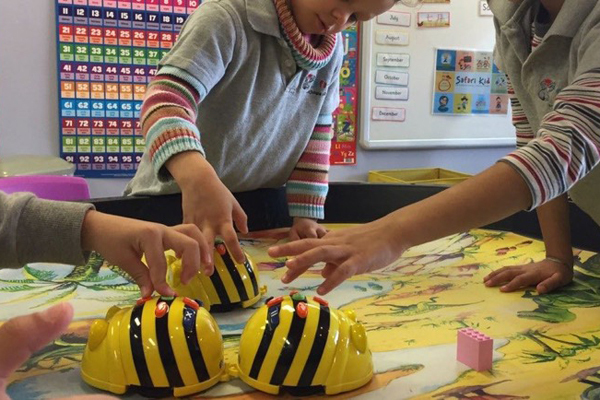 There are currently four London branches (Clerkenwell, Chiswick, Windsor and Golders Green) offering a varied curriculum of free and structured play, with the highest standards of communication and care. The sensory rich environment is clearly inspired by nature with a well thought out garden area for children and an abundance of natural light in the bright, open plan spaces. 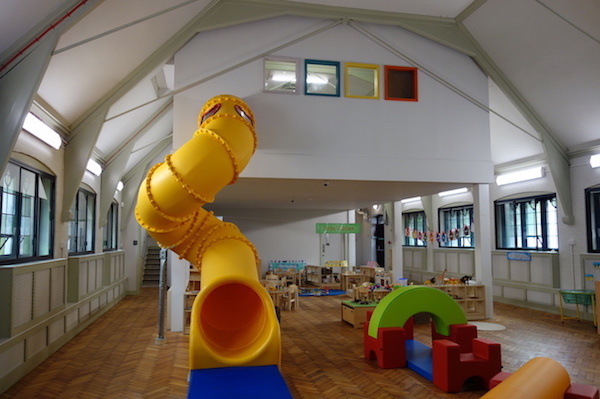 And I mustn’t forget to mention the huge slide which leads down from the preschool room to the main room – every nursery should have one of these! Another huge difference that sets Safari Kid apart from other nurseries is the neutral, calm décor, a deliberate reflection on recent research to ensure children are not too overstimulated by bright, primary colours. Combining the best of global pedagogies, such as focusing on readying children for school, whilst adopting Montessori style methods of creating independence, offers a well-rounded curriculum at Safari Kid. While there are three classes in different areas of the building (Early Explorers, Turbo Toddlers and Preschool), all children have access to generous play spaces, allowing for a whole host of learning opportunities. In fact, I observed an ice science investigation happening in the toddler room during my visit, as well as lots of songs, laughter and games in the outdoor area! 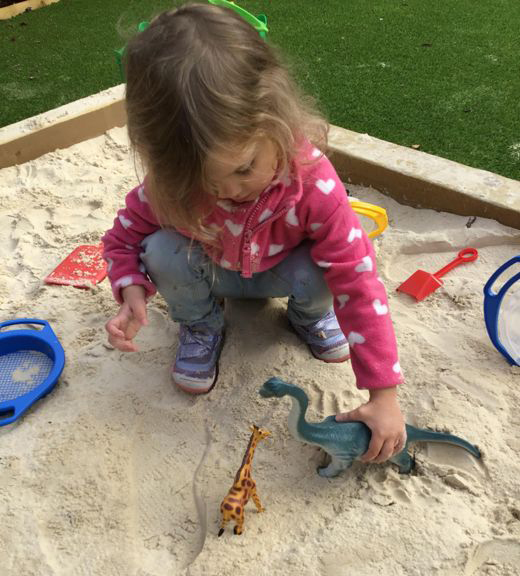 The nursery adopts a thematic approach to immerse children in their learning, with the most recent topic being ‘Dinosaurs’, which enabled them to play outdoor games to learn about herbivores and carnivores, as one example of learning through play. A truly distinctive feature of this early years setting is their focus on building regular and transparent relationships with parents. As a mum of two young children, I know the struggle of finding the right childcare and feeling confident leaving your prized offspring with strangers, which is why I love that there is a dedicated member of staff (a Parent Relationship Manager) onsite dealing with parent enquiries, freeing up the Nursery Manager to engage, inspire and teach. All teachers also use an app (which parents can access) to record observations, such as written notes and photographs, so you can see just what your child is up to throughout the day. This would be massively reassuring to any parents who are somewhat anxious about returning to work! Not only that, but you can also add photographs of learning experiences from home, as well as comments, creating a real partnership between nursery and home. Ultimately, the enthusiasm and warmth of the nursery staff is what really sold Safari Kid for me (not to mention to the incredible – and healthy – catering!). This is modern, early years education at its finest. Don’t just take my word for it though – you can find more parent testimonials here or check out the Safari Kid website for more information. 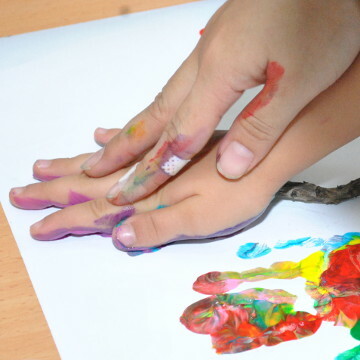 “Safari Kid Golders Green is a wonderful nursery that has a warm and caring environment. My little one really loves spending time at the nursery and always looks forward to attending. We’re very happy with our experience thus far”.